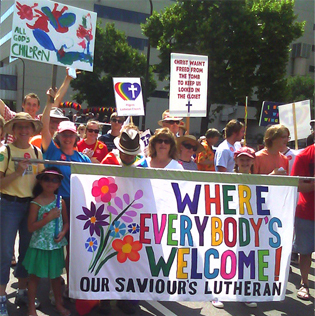 Our Saviour’s Lutheran Church is a dynamic community, centered in Christ, called, nurtured and sent – to celebrate, serve and do justice. OSLC has been a Reconciling in Christ congregation since 2002. In 2013, we approved a resolution to offer same-gender marriages. Since then, we have rejoiced in being part of the start of several new same-gender households, and in being part of a Christian community where they grow in and explore their faith as full members. That as members of this congregation, people of all sexual orientations and gender identities are expected and encouraged to share in the sacramental and general life of this congregation. What it means to be a Reconciling in Christ congregation.